Monthly payment of $40 per month. You can cancel at any time. One-off annual payment of $360 (saving $120 per year). You can cancel after 1 year. Choose which option you prefer from the drop down above and then click the yellow Subscribe button to pay via Paypal or with a credit card. If you don’t have a Paypal account and prefer to pay with a credit or debit card, I can invoice you for the annual amount ($360) and you can pay that way, just contact me to do this. Scroll down for FAQs. 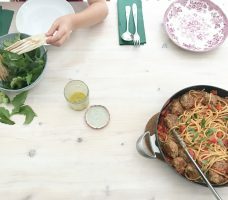 My award-winning recipes are written for all levels of ability, addressing the questions I’ve been asked during my 6 years of teaching busy families to cook in the UK and California. I’ll make it really easy for you to get around the shops, knowing that what you buy will be used. You’ll gain confidence, save money and your household will eat better. Stop cooking more than one meal a night and learn how to serve one meal for the whole family without drama. The meals are all based around unprocessed foods – loads of fruit and vegetables, whole grains and proteins. Each meal has simple instructions to explain how to make it suitable for vegetarian, gluten-free or dairy-free. When you sign up, you’ll get an introduction pack with my top 10 tips for dinners without drama, a guide to seasoning, freezing and storing food safely, a store cupboard guide, how to videos as well as a 15% discount on any classes you book with me. Four weekly meal plans and shopping lists. Follow the plan rigidly or, as most people do, use it as a starting point and fiddle with it a bit to suit your needs. The weekly shopping list is by aisle so you can you use it to do online or real time shopping. A booklet with exclusive recipes for 16 meals to try each month The recipes are tried and tested and have ways of being switched around to suit chaotic mealtimes and a range of dietary needs. Each month the recipes will make the most of what is in season and will start to stock your freezer and fridge with building blocks. These recipes won’t appear on my website or elsewhere. A quick-to-watch video where I talk through the plan for the month, share some tips and show you techniques that will help you cook better. The welcome pack and materials for your first month will be sent to you on on the day you sign up. I send the materials during office hours so you may need to wait a few hours to receive your first pack. Then each month after that, you’ll receive an email on the first of the month with all that month’s materials in. The first payment will be taken when you sign up. If you’re paying monthly, your monthly payment will come out on the date that you sign up – so if you sign up on 11th January, you’ll pay $40 each month on the 11th. You can cancel your monthly payment at any time. If you’d like to switch to an annual subscription after your first month, you can just pay the difference of $320 for the the year. Any other questions, please contact me.